Yesterday, I returned to Seoul for a day with friends. I had been planning to get up early and arrive early; at seven o’clock, I reset my alarm to 8:30, having not slept well or long enough. I got the slow bus up to Shinsegae and bought a ticket from the nearby Intercity Bus Station (for ₩5,000). With some free time, I looked around for somewhere to buy hodugwaja – a walnut cake snack thing for which Cheonan is famous – and found a little shop inside the Shinsegae building at the Express Bus Terminal. The extremely close proximity of these two bus stations is a bit confusing; I’ll have to try getting a bus to Seoul from the express terminal next time. My bus from the intercity terminal left on time and arrived at the Express Bus Terminal in Seoul an hour and five minutes later. Through the magic of Facebook, while phoneless, I was able contact Jeff, the gaming host, from a café in Noksapyeong and got directions to his place. There, with Jeff, his friend John, Matthew and Zach, I played Magic: The Gathering with the decks I’d brought. I beat Matthew – the only other person with Magic experience – in a demonstration game; then John, the gaming newbie, held on to the end of a four-handed multiplayer game, using an Izzet Guildmage to burn Matthew and Zach (I’d already fallen). Then we played Zach’s Munchkin with all five people; I almost won at one point, but was thwarted. I lost concentration towards the end because I was in danger of being late for my dinner date, but it was great to be back amongst friends and gaming again. Matthew and I shared a taxi to Sinsa, where I met Gemma, my old colleague from my last job in Korea. We had Mexican food and later sake and later still coffee and/or hot chocolate. It was really nice to see her again and we talked about life and stuff and things. I got a five to midnight bus back to Cheonan. When I arrived back, seemingly everyone else on the bus had headed to the main street to get a taxi – of which there were few around. I decided to walk some or all of the way home. There was a frozen drizzle falling and the ground was pretty slippery – I fell once. I got a taxi home from Cheonan Station, where there were several taxis waiting and few people around. I slept late today. Did some laundry after breakfast and found that no water poured into the top-loader machine as usual. After examining the piping, I realised that the tap was frozen. I boiled a pan of water and poured it over said tap and the water eventually started flowing. Later, I went for a walk up a mountain just to the north of where I live. I say ‘mountain’, but really it’s just a forested hilly area. With all the recent snow, it was a pleasant walk – the snow had prettified the landscape and the trees. Without it, it would have been a very easy trek, but the paths were covered in more or less compacted snow, so you had to take care. I fell on my arse at one point, just behind a pair of women – who exclaimed and looked around, but, of course, didn’t stop to help or ask if I was OK. No damage done, though. So far, I’ve made contact with old friends in Seoul and Daegu, but have made no new friends (outside work) in Cheonan. I’m thinking about doing something about that. 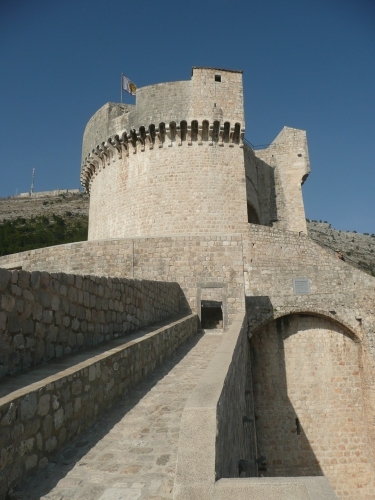 We took an afternoon bus from Kotor up to Dubrovnik in southern Croatia. The bus was a nice modern one, but the driver drove too fast for our delicate Western sensibilities. 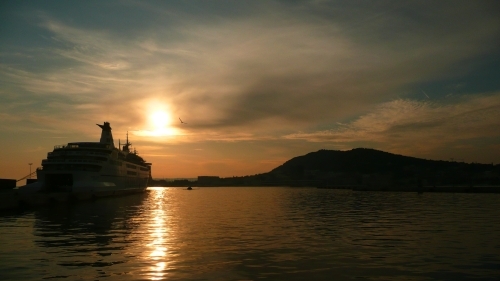 In Dubrovnik we were met at the bus station by someone from the hotel we were to stay at, Villa Micika. The owner was on Couchsurfing and offered his place for free during January and February because business was so slack; as we were arriving in March, he offered us a room for half price. 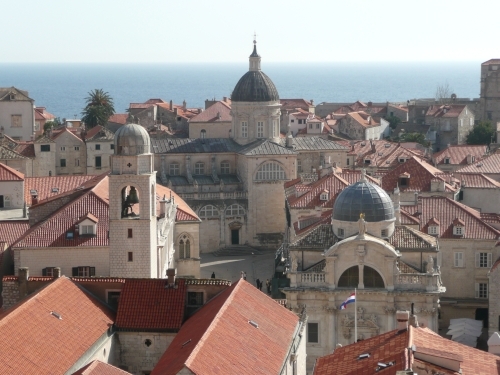 Dubrovnik was a bigger town than Kotor and the hotel was some distance away from the old town. The day after we arrived, we walked there, stopping to take some photos of the coast. The walled medieval city turned out to be just as beautiful as Kotor – perhaps more so, as it had lots of interesting churches and other buildings. The place was laid out in a more orderly fashion, though, with a wide main street running straight from one side to the other. 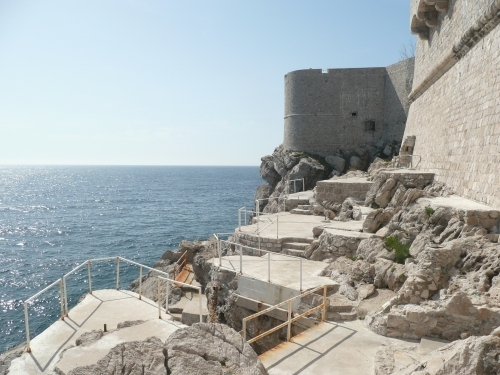 We found a little doorway in the walls on the Adriatic side and had a picnic on some rocks that had been partially concreted over to make convenient platforms. In the same area, in an alcove in the inner side of the wall, we found a cat with no eyes. The alcove was covered up with cardboard and inside there were numerous bowls of food. Apart from its rather runny eye sockets, the cat looked quite healthy. As we stood there peering in, it turned its head in our direction, but didn’t move otherwise. Later, we found a way up on to the city walls and walked around taking in the view and taking lots of pictures. At the first steps we tried to go up, we were told to buy a ticket. We couldn’t find a ticket office, but someone else told us to walk around a lower part of the wall. We eventually found a young guy who seemed to be a guard or ticket inspector; he was texting or playing on his phone and he told us we could go on without a ticket. So we did. Early the next day, we made our way to the bus station again to catch a coach up to Split. Dubrovnik is in an enclave of Croatia between Montenegro and Bosnia and Herzegovina’s narrow sea coast, so we had to pass through two borders to get to Split in the main part of the country. A group of men got on the bus in Bosnia, but for whatever reason they had to get off again at the checkpoint for Croatia. We got off at the bus station – which is adjacent to both the railway station and the ferry port – a very convenient set-up. We had to get another bus to our next Couchsurfing location. When we got off the bus, we walked in the wrong direction; realising this we asked various people for directions and had to contend with people not speaking English, not wanting to help or pointing us in the wrong direction. Eventually we got to the right apartment building, but couldn’t figure out how to get inside it. The lower floors were occupied by shops and cafés and the entrance to the flats was very unobtrusive. Finally, one woman we asked took us right to the entrance. Our host, Tim, was less than talkative at first. We asked him did he work there and he just said, No; we asked if he was studying: No. He warmed up a bit later and told us that he’d also worked in Korea and had travelled across Mongolia and Russia. The place – a very nice, fairly spacious flat – wasn’t actually his, but he was house-sitting for a couple of his friends. He spent pretty much all his time playing an old computer game – Arcanum – which was the reason he couldn’t come and meet us and take us home. 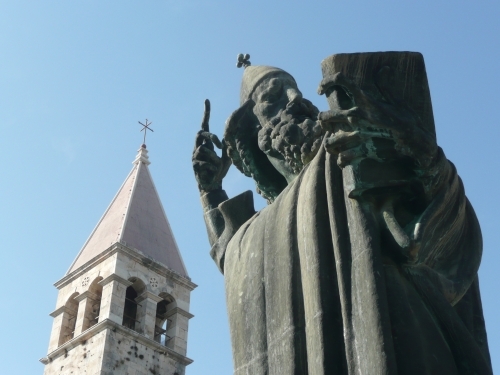 Needless to say, he didn’t take us anywhere in Split, but he did give us some advice about what to see. 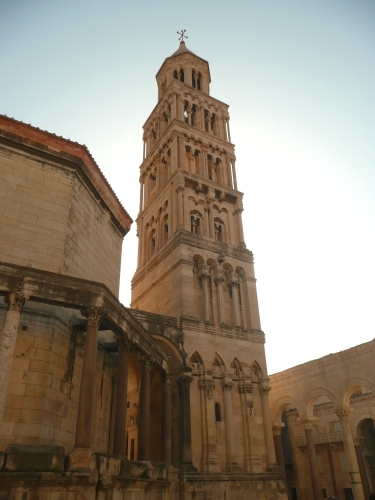 The next day, we walked to a nearby marina and along the coast to stations, on the far side of which is the main tourist area around Diocletian’s Palace, a Roman ruin. 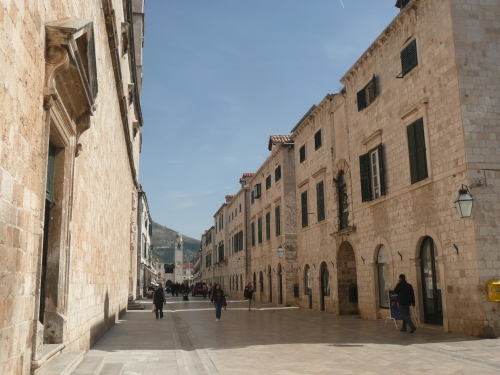 The place was nice enough, but not as well preserved as Kotor or Dubrovnik old towns. After sightseeing, we headed back home to pack and leave. We said goodbye to Tim late in the evening and walked back to the bus station to wait for our overnight coach to Zagreb. 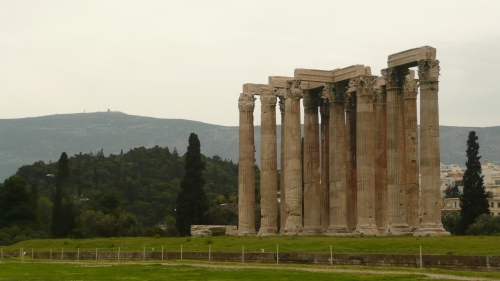 The day after we returned to Athens – Saturday – we did some more sightseeing – the Temple of Olmpian Zeus, which was very close to our hostel – and planned our journey to Albania the next day. We should have done that planning earlier, really. We thought we would be able to take a bus to Ioannina in north-west Greece, then another to the border town Kakavia, then another to Gjirokaster in southern Albania, and a final one to our destination of Berat. Probably doable. However, Habiba spoke to the travel agency that had organised our trip to Santorini, and found that there were Albanian travel agencies that run buses to the country. So we went to the area where they all reside and bought tickets for a direct night bus to Berat for €35 each. Habiba’s mum left very early for Istanbul and a flight home the next day. We were going to have breakfast together, but she decided she needed to get to the airport as early as possible. We said goodbye to her at the hostel and then went back to bed. 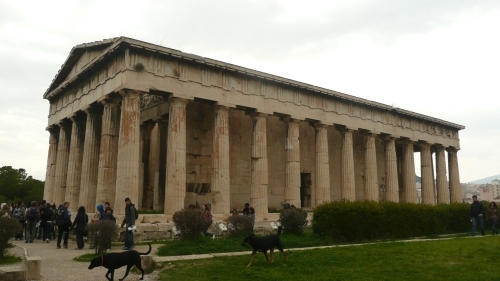 As we were now not travelling during Sunday daytime, we had another day to look around Athens. We had breakfast at a café with lots of baked stuff near the Acropolis. A small flock of little birds sntached up our crumbs – which we provided readily enough from our crumbly pies. Then we went around the Roman Agora and the Ancient Agora. We didn’t have to pay any entry fee for either because it was Sunday. 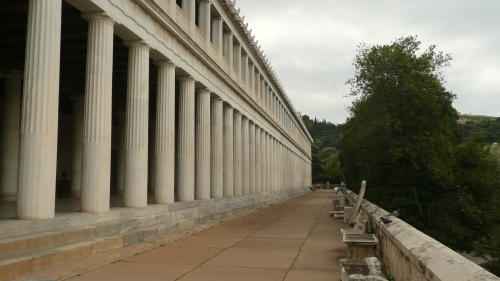 The Ancient Agora is in a large park that contains a completely reconstructed ancient building, the Stoa of Attalos (a stoa is an arcade), and the Temple of Hephaestus, which is perhaps the best-preserved ruin we saw. 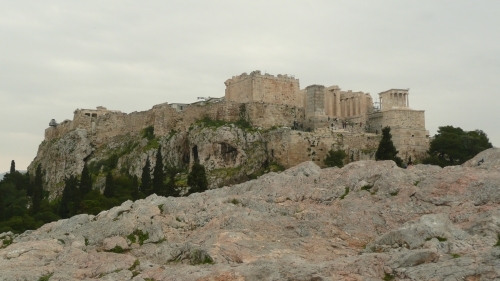 Afer that, we walked up a nearby hill called the Areopagus, which provides a great view of the nearby Acropolis. It started raining while we were up there, so it wasn’t all that pleasant. We headed back to Snytagma and watched the soldiers dressed in traditional tunics in front of the Helllenic Parliament building. They were evidently in service of the Ministry of Silly Walks, as they slowly marched back and forth with exaggerated leg movements. Behind the parliament is the National Garden, which was not exactly bursting with colour, as it was a rainy early spring afternoon. In the evening, we picked up our bags from the hostel and made our way by subway to the Albanian travel agency and – with some communication difficulties – got on our coach bound for Berat. The seats were pretty small. The bus was less than half full; we considered moving to different seats to get away from people behind us kicking our seats, but we reasoned there would probably be more pick-ups later. We never did move and there was only one person picked up along the way. The ride was pretty hair-raising. The driver powered the bus along narrow, winding mountain roads. As it was night-time, we couldn’t really see much outside – probably a good thing. The drive was so hectic that getting any sleep overnight was out of the question. When we got to the border, we got out of the bus and presented our passports one by one at the Greek Immigration desk. Then we drove on to the Albania checkpoint, where a man got on the bus with a passport-width wooden box and collected everyone’s passports. A while later, the driver’s assistant gave them back to us. Habiba and I check our Albanian stamp – plain black and not very interesting. Then we had more windy roads to navigate up through Albania. Past Gjirokaster, closer to Berat, which is in the southern central of the country, the roads degenerated to patchy country lanes. The bus had to slow right down in many places in order to pass. Then there were various stops at small towns near Berat that drew the ride out to thirteen hours. I showed the driver the address of the place we were staying at and he eventually let us off at a footbridge we had to cross. From there it turned out to be a short walk to the guesthouse. At the weekend, Habiba and I went to Osan, one of Seoul’s satellite cities, about an hour’s bus ride south of the capital. We went at the invitation of Habiba’s friend Jessica, and we stayed with Jess’s friend Laura. We left on Friday evening, going from Nambu Bus Terminal in southern Seoul and travelling with Habiba’s colleague Aiden and a couple of his friends. Over the last two or three months I’ve been trying to up my writing output, so spending time away from home can be a great irritation, not to mention the fact that spending time with a group of people I don’t know well is very stressful for me. I was worried that going on the trip was a mistake. Habiba had the same thoughts, too, and talked about it on the the ride down. When we arrived there, we met Jess and Laura at the modest bus station. Jessica (Canadian) took Aiden (Irish), TK (Korean) and Adrian (Australian) to a hotel; Laura (South African) took Habiba (American/Canadian) and me (British) to her place. After that, we had dinner at a galbi (Korean barbecue) restaurant. After that we went drinking at an American-style bar, WA Bar. And after that we went to a noraebang (Korean karaoke) place. The music at the noraebang was better that usual – some of it actually sounds like real instruments. I bored everyone with ‘Some Kind of Monster’ (it’s over eight minutes long – the intro is two minutes long). The next morning, after far too little sleep, we were fed tasty blueberry pancakes by Laura, and we were joined by Laura’s boyfriend, Chris (British). Then we gradually made our way to the nearby, slightly larger, city of Suwon. 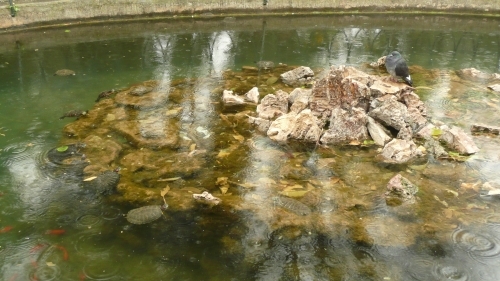 I’d been to Suwon the year before last to visit the fortress, or Hwaseong. I remembered the station area with its big D-shaped road in front. Last time I walked; this time we taxied – once we found the correct taxi rank. We didn’t actually get to the fortress itself – a large ring of fortifications that dates back to the 18th century – but we did spend an hour or so looking round the associated palace, Haenggung – an area I completely missed on my previous visit. After lunch, Aiden, TK and Adrian left us to head back to Seoul. Much of the rest of our day was taken up with travelling back to Osan. The distance can’t be much more than ten kilometres, but it took us two hours. The problem was that there is a one-stop branch line on the subway between Osan and Suwon and we weren’t paying much attention as we were playing a word game (taking turns to name adjectives beginning with the same letter letter – angry, adroit, awkward etc). We first went to the branch line stop, then waited (I think we missed one train that would have taken us back to the mainline through inattention), then got off at the right stop and promptly got on the next train – which, of course, took us back to dead-end branch line. Eventually, we paid attention and got back to Osan. We had dinner at a Thai restaurant near a US airbase along with another friend of Jess and Laura’s, another Jessica (American). Then we had more drinks (despite the fact that I shouldn’t be partaking with my bowels) and more word games. On Sunday, we were resolved to go to a folk village somewhere close to Suwon. However, although I didn’t get noticeably drunk the previous night, I had a headache that got worse throughout the day – no doubt due to the hot, sunny weather. As headaches do when they get bad, it started making me feel nauseous. I informed Habiba by text (I was on the toilet) that I didn’t think I could make it through an afternoon on my feet outdoors. We ended up going to see Toy Story 3. In 3D, no less. I wouldn’t have chosen to see it in 3D, but we didn’t have a choice – unless we wanted to watch the dubbed version. It was a good film. The Toy Stories are a solid bet for humour and emotional content, and for appealing to children and adults alike. Actually, 3 was probably a bit strong for young kids. Woody, Buzz and co are forced to face the final frontier – which for a toy is being thrown away and destroyed. Don’t worry – it has a happy ending. Probably the highlight of the movie was Buzz Lightyear being switched to Spanish mode and dancing a little flamenco dance for Jessie, including a hilarious crab scuttle move. As with the only other film I’ve seen in 3D (How to Train Your Dragon), it wasn’t worth paying the extra for what is effectively much lower picture quality. Then we went back to Osan to pick up our bags and catch a bus back to Seoul. Given what I described in the second paragraph, it was a surprisingly good weekend. I didn’t get any work done, but we had a lot of fun and made a couple of new friends (we’re connected on Facebook now, so it must be true). This coming weekend, I have a thing with work. They call it MT – management training – here, I understand. We’re going rafting. I don’t really know much about except that I’m on the white team, which means I’m supposed to wear something white. The only white tops I have – and I have surprisingly many – all have ugly yellow-green stains on the underarms.